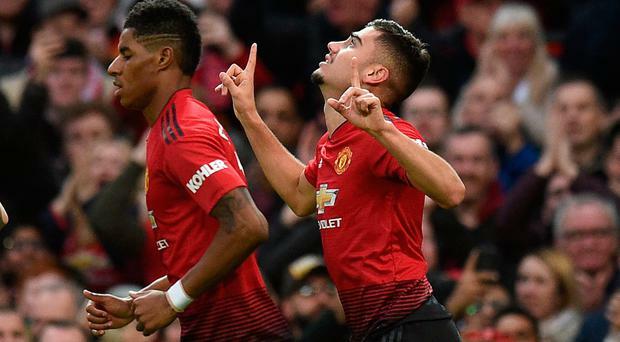 Manchester United's Belgian-born Brazilian midfielder Andreas Pereira celebrates his first ever Premier League goal. Yan Valery celebrates at Old Trafford. Romelu Lukaku's brace sealed Ole Gunnar Solskjaer's Manchester United a thrilling comeback win against struggling Southampton on an afternoon of exceptional goals. While a lot has changed in the three months since Jose Mourinho's Reds overcame a two-goal deficit to frustrate Mark Hughes' men, these sides still managed to throw up another helter-skelter goalfest. Yan Valery rocked Old Trafford with an outrageous opener for Ralph Hasenhuttl's visitors, only for Andreas Pereira to level with a similarly impressive effort and Lukaku to put United on course for victory. Ever-improving James Ward-Prowse bent home a brilliant free-kick to hush Old Trafford, but Lukaku had the final say by lashing home to seal a 3-2 win that propels Solskjaer's side back into the top four. It was a late gut punch for the visitors, in a game which could easily have got away from Saints in the early stages was it not for their goalkeeper Angus Gunn, who superbly denied Lukaku twice within the opening five minutes. It appeared a case of when rather than if the hosts would score, only for a break in play as Scott McTominay received treatment to see Saints regroup. Imposing defender Jannik Vestergaard wasted a great chance from Ward-Prowse's corner, with Chris Smalling fortunate not to give away a penalty after Ryan Bertrand got in behind him. Saints were holding their own and were quietening Old Trafford, which fell silent in the 26th minute. WOW! The youngster hits a right-footed thunderbolt from distance that flies into the top corner past David De Gea! The pocket of Saints fans erupted in disbelief and United were unable to respond before the break. Things could have got worse for the home side as Bertrand went down in the box, with Ashley Young claiming a dive when realistically it could easily have been a spot-kick. Referee Stuart Attwell gave nothing. United's challenge looked to have been made tougher when Alexis Sanchez was forced off early in the second half, but his replacement Diogo Dalot helped turn the game on its head. Marcus Rashford headed just wide when reaching the substitute's cross, before the Portuguese provided an assist for a goal that Pereira will rightly take the plaudits for. The Brazil midfielder got the ball and cut on to his right foot, before curling a superb strike out of Gunn's reach in front of the Stretford End with 53 minutes on the clock. Southampton goalkeeper: I am Superman. Pierre-Emile Hojbjerg and Nathan Redmond tried to restore the visitors' lead, but United have an unerring ability to come back against Saints. Within six minutes of drawing the home side level, Pereira pushed the ball through to Lukaku. Offside calls were ignored, and the striker cut away from pressure to rifle a low shot past Gunn. Dalot leathered a long-range strike just wide and scooped over as United looked to press home their advantage, but Saints got a set-piece opportunity after Young was adjudged to have fouled Stuart Armstrong. Free-kick expert Ward-Prowse hit an outstanding strike to beat De Gea from distance and send the Saints fans wild. Valery and Vestergaard tried their luck as the visitors pushed for a winner that would come at the other end two minutes from time. Substitute Fred played into Lukaku on the edge of the box and he made himself space to fire home a low right-footed shot in front of the Stretford End. United had the chance to add gloss in stoppage time after Rashford was fouled by Armstrong, but Gunn denied Paul Pogba's spot-kick. Roy Keane and Gary Neville took different opinions on Man United's performance after the Red Devils fell to yet another defeat in the Manchester derby last night.